This past Saturday was a blast, although I must admit I came home absolutely exhausted. I met a ton of cool people: fans and fellow artists. 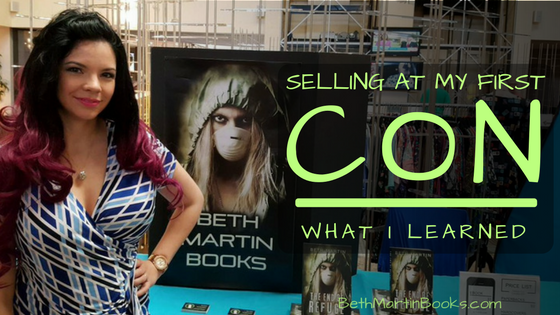 The other writers I met do a ton of conventions and I will totally pick their brains on what works and doesn't as far as selling books in person and which other local cons I should go to. I did learn quite a few things from my first convention experience and thought I'd share the highlights. I totally failed on this one. I wore heels (which I don't wear as often as I did in a previous life), a stiff underwire bra, and an elaborate and incredibly hot hairstyle. The shoes were the first to go but at least I had thought ahead and brought a backup pair. As the day went on, the room got hotter and hotter and the thick luscious curls insulating my neck only made it worse. Eventually, it was too much and I shoved my carefully styled locks into a messy ponytail. Ahhh... what a relief. I felt bad for some of the people cosplaying who were clearly overheating. At least the venue offered unlimited ice cold water for free. There wasn't much I could do about the bra situation. I have other outfits that are both professional and allow for more comfortable undergarments, so I'll know to wear one of those for future events. I had a great time meeting the other artists with tables at the con. The room was seriously packed with talent. A number of them had even worked together--one person selling a comic they wrote illustrated by other artists attending the con. I got a chance to ask other artists about their work and creative process as well as sharing my own. I also learned about other events in the area that I might have to attend. When designing the cover for The End of Refuge, I kept in mind how it would look alongside similar books on the Amazon marketplace and what it would communicate to readers. And wow, that careful consideration really paid off. Every person who approached my table predicted the dystopian theme. Those that said they didn't really read that genre didn't even pick up my book. However, the people who were interested in the cover enough to ask me what my book was about almost all purchased a copy. I was pretty pleased with the number of books I sold. On the other hand, there were a bunch of other people selling cool stuff. It would have been easy to get carried away (so much art! awesome board games! Toys! Books!). I did my best to not go crazy buying stuff, but man it was hard. The next event I have planned is the Baltimore Book Festival in September. But keep an eye on my events page--I might have to add another con or two!